The sentence makes that line break into two. Here’s a caesura: see what it can do. 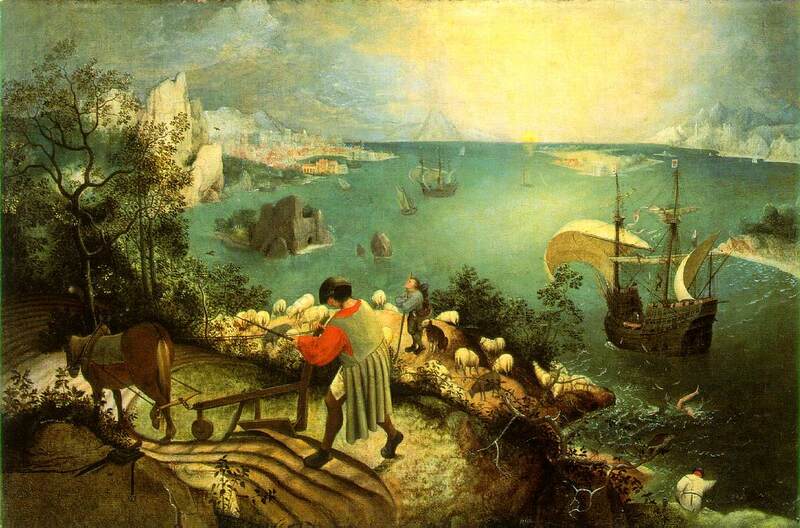 This painting is Brueghel’s Landscape with the Fall of Icarus. You will probably need to click on the picture to enlarge it in order to see Icarus clearly. If you were visiting the Royal Museums of Fine Arts in Brussels in a bit of a hurry and didn’t know the painting’s title, you might even walk by without even noticing that Icarus is in the painting at all. This, according to two very great poets who wrote about this painting, is the whole point. The human mind has a few very unuseful questions it seems to be tugged back to by some kind of primeval mental gravity whenever it can’t think of anything better. One of them is Whose is it? – which has probably caused more trouble than any other question we are capable of framing. Not far behind is Which do you prefer? We love splitting into teams, especially if we can reduce ourselves to just two of them which are bitterly opposed over something totally unsubstantial, as in the case of the Blues and Greens in Byzantium, Catholics and Protestants or the Big Enders and Little Enders who Gulliver ran into.